When FLMSP received a membership application in the mail with “The bike trail has saved my life” written on the top, we were curious. 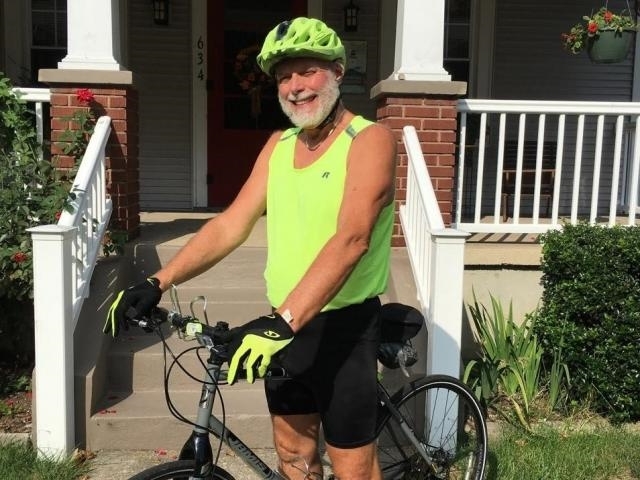 Roger Kleinfelter, a retired accountant, is 69 and bicycles most every day on the Little Miami State Park trail. He is also legally blind. After a divorce and the death of his best friend, Roger decided he had to get out of the house and do something new. So he got out his bike that he hadn’t used in ten years and began to ride, just 6 to 8 miles at first. He also joined a group exercise class at the gym. After wearing out two bike chains, his pedals and a sprocket, Roger had worked up to being able to ride 44 miles. Last spring he got a new bike with disc brakes. He’s also lost 30 pounds. “I haven’t been this thin in 25 years,” he says. Roger’s poor eyesight means he has to be extra-cautious when he cycles, and that takes a great deal of concentration. He appreciates the newly paved sections in the southern part of the trail that are 2 feet wider, giving him a bigger margin when passing slower trail users. When others are wearing black and are in the shade, it’s difficult for Roger to see them. This is another good reason to follow the advice in this month’s safety article on how to be seen when on the trail. Website by Christoher Sandman | Hosting by NavigateTomorrow, Inc.